Walk into a classroom almost anywhere, and you will see this same scenario: Teacher asks question. Students raise hands to answer. Teacher calls on student for answer. It happens every day in classrooms. Truth be told, until I knew better, it happened in my classroom. Yet, this overused classroom practice contributes significantly to the achievement gap in our schools (Wiliam, 2013). 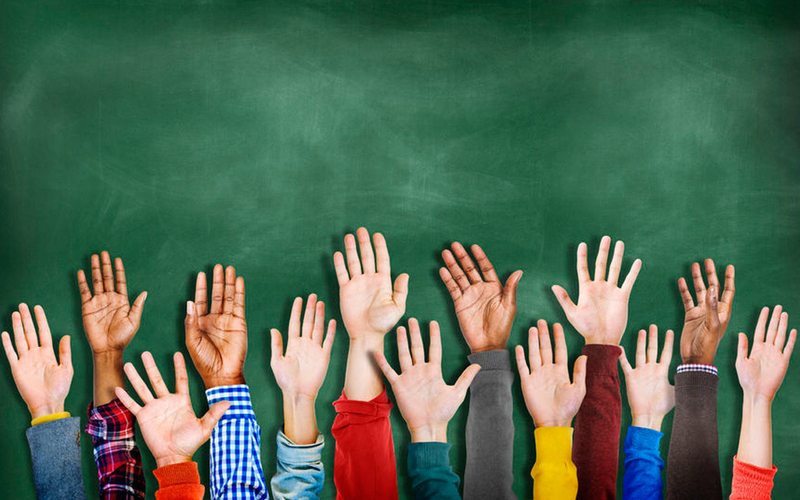 Essentially, when we tell students to raise their hands to answer, we sending the message that they can choose whether they want to participate in the lesson. Further, of those students who are raising their hands, only 25% are participating consistently. I don’t know about you, but a mere 25% of student participation in the lesson is not okay with me. My goal is always 100%. Additionally, when we think about the students who often raise their hands the most—who are they? Clearly, they are the students who most often know the answers. Now, let’s think about this from the perspective of practice opportunities. We know if students are struggling with a concept, they need additional opportunities to practice in order to be successful. The crux of this is that these are often not the students raising their hands and answering. Because of this, the students in most need additional practice are often receiving fewer practice opportunities than the other students. Another caveat to hand-raising is often called “fishing for answers.” We ask the question and a student answers, but it is not the correct answer. Maybe it is close—we might say something like, “Close—can anyone him out?” Then, we call on another student. “Not quite, but we’re closer—anyone else?” And it continues. We keep “casting” and “fishing for answers.” Perhaps we finally get to the correct answer. But the question is: How many incorrect answers did students hear before hearing the correct answer? What are they most likely to remember? So, this all said–what can we do differently? Let’s break this down by looking at examples of how to implement this strategy in the classroom. Remember, one of our vocabulary words this week is reluctant. What is the word? (reluctant) Reluctant means you are just not sure you want to do something. When you are not sure if you want to do something—when you’re hesitant—you’re (reluctant). Think. What is something a cat might be reluctant, or hesitant, to do? Start your sentence like this: A cat would be reluctant to…. Turn to your shoulder partner to share your answer. A’s will share first, then B’s. Remember to use your sentence frame to speak in complete sentences. Randomly call on students to share out their answers. What forest and weather characteristics makes a temperate rain forest different than a tropical rain forest? Pass out sticky note to each student. Take out your sticky note. Take one minute to write the sentence frame and then complete the sentence by listing the differences you’ve brainstormed. Use popsicle sticks to call on 2-3 students to share their answer written on their sticky note. Remember to require students to use their sentence frame to speak in a complete sentence as they answer. To further encourage 100% participation, require students to add any differences shared out that they did not originally have on their sticky note. Hold up piece of 8 ½ x 11 paper. This rectangular piece of paper is my whole. Watch as I fold this rectangular strip of paper into three equal parts. Fold paper. How could you write a number sentence to describe this decomposition? Provide 5 seconds for students to individually think and brainstorm. Start your number sentence with 1=. Write down your number sentence. [Provide 10 seconds for students to write down their sentence]. Now, turn to your shoulder partner. Share your number sentence and thinking. Provide 20-30 seconds for students to discuss and prepare. Randomly call on students to share out their number sentences and corresponding thinking. Access our free downloadable of the 5 Step Questioning Strategy! Great strategy! This allows everyone to have a chance to respond. So much better than only a couple students getting to answer. Nice way to build a positive classroom environment too. Thanks, Denielle! I agree that it gives everyone a voice and helps build a positive classroom environment!